Show off your Squiers with Humbuckers! Discussion in 'Squier Stratocasters' started by Stratty, Dec 29, 2009. I just wanna see how many people on here have one humbucker or more on their strat,mini buckers count. CajunJam, mb doug, BlueSquirrel and 3 others like this. I'm a HB guy. I can't do without. 13 NC's ... all but one with at least one HB. HHH, HSS, HSH, HH, even a quad. Taurus, BlueSquirrel, dbrian66 and 1 other person like this. Yes, I want a Hello Kitty in my collection also. dbrian66 and Eddie like this. Yes, and really pricie also. I'm hoping to come across one in a garage sale or something where someone is just trying to sell their kid's stuff without knowing the value. dbrian66, drewcp and RoyalWe like this. Here's mine. 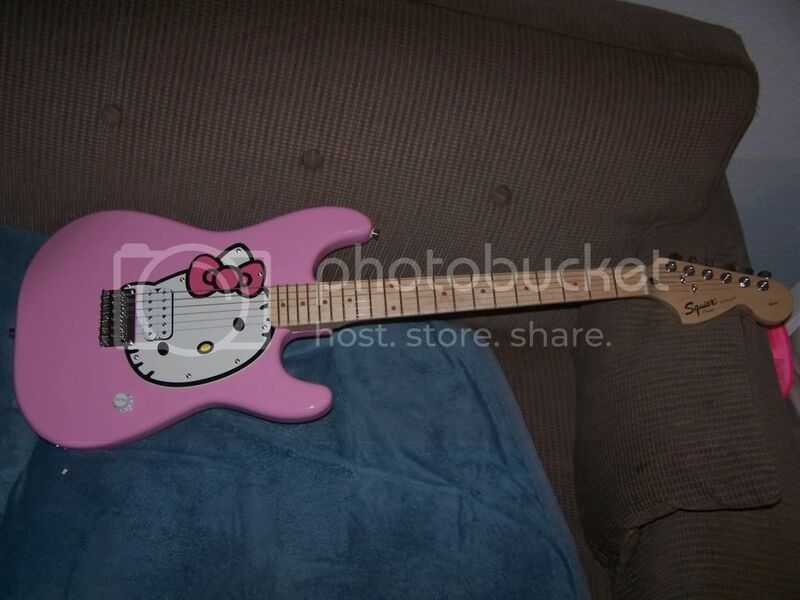 I got the cherry burst from Brittany a couple months ago in trade for my Avril Lavigne tele that she fell in love with. And I also just realized it still has the Fender sticker on it in this picture. I hadn't gotten my Squier waterslide at that point, its got the correct logo on it now. Rat cam 68, mb doug, dbrian66 and 2 others like this. CajunJam, mb doug, BlueSquirrel and 7 others like this. dbrian66 and fattboyzz like this. My only Strat with a humbucker in it. optofonik, Rat cam 68, mb doug and 6 others like this. I love that look ! dbrian66, fadetoz and Eddie like this. I never thought I'd like a Strat with covered pups, but man, those look fantastic. I love the gray color as well. Is it a custom color? BlueSquirrel, dbrian66, fadetoz and 1 other person like this. Wow! that was a while ago. I have a few more now.They're mostly Squier parts. mb doug, dbrian66, fattboyzz and 3 others like this. Rat cam 68, mb doug, BlueSquirrel and 5 others like this. It was a stock Squier VM color. 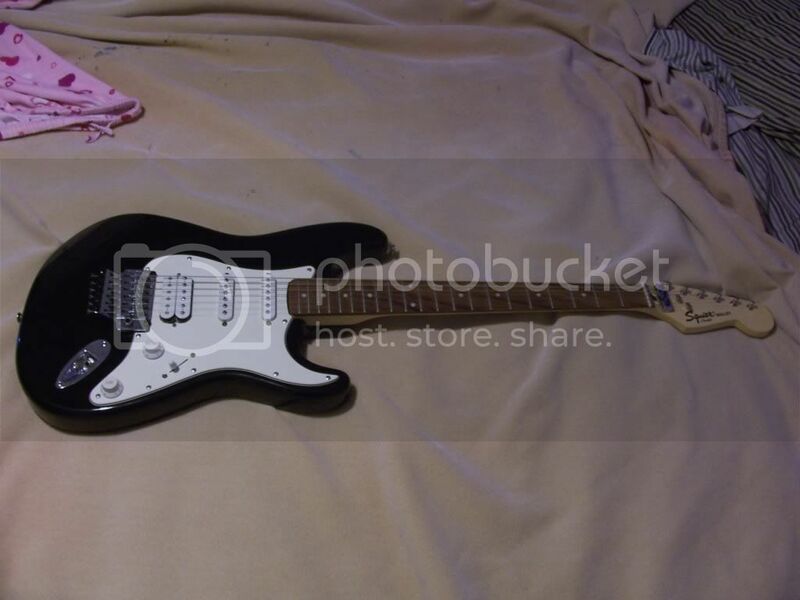 Funny after I was done I thought if I put amp knobs on it, It would look like a blacktop Strat. FSR Hot Rod MIM buried in my memory bank..
Not mine and not a strat but its also locked in my memory bank.. sweet humbucker heaven..
CajunJam, mb doug, Tconroy and 5 others like this. I have only two. The black one has been with me for about 30 years, I built the orange one last year. CajunJam, mb doug, Taurus and 4 others like this. Howza bout pics of single coils on a Les Paul?